RVnGO is America's best marketplace to find RVs to rent in Hawaii. Find your RVnGO! The USS Arizona Memorial is dedicated to the individuals who battled and lost their lives at Pearl Harbor. This tragic event in U.S. history has everlastingly molded the nation and this feat of engineering draws guests to honor those who made the ultimate sacrifice. The landmark floats in the blue water of Pearl Harbor. Guests can watch film footage from that era and view the sunken ship just beneath the surface through the glass base of the landmark. Not far from the damp green backwoods and waterfalls of close-by Manoa Valley is a landscape that looks out of this world, the Diamondhead Crater. This 300,000-year-old well of lava site is a prominent climbing goal for the more adventurous. 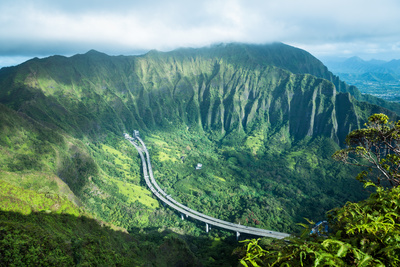 Well-known for the spectacular view at the very top, climbers lift their way up to the summit of the crater and are rewarded with a view of the entire Waikiki coastline. Make certain to pack a lot of water and safe shoes as the trail can be hot and uneven. This hot spot is very accessible for your Hawaii RV rental . The Wahaiwa Freshwater Lake is inland from the bustling of Honolulu, Oahu and is a popular recreational area with RVers in Hawaii for those who want a more peaceful experience. Guests can fish, picnic, and climb about while feeling totally apart from the world even though itâ€™s just a couple of miles from the city in their Hawaii campervan rental! A "no nonsense" campground, Malaekahana Campground is one of the best choices for RV rentals in Hawaii, Oahu Island. It can contain RV's without any hookups. RVers can utilize its restrooms and showers with their Hawaii camper rental. It includes a camp store, and a food truck where you can have flavorful Hawaiian meals from 8 am to 2pm every day. Take advantage of the opportunity to learn how to body board, surf, or SUP with lessons and rentals. A few steps from the beach, Malaekahana Campground is an island paradise for your campervan rental in Hawaii. RVers who intend to spend a couple of days in RVing on Maui will enjoy Camp Olowalu. Truly an idyllic paradise, Camp Olowalu, is 6 miles southeast of Lahaina. It offers a limited number of auto and RV spaces without any hookups, so reserve your Hawaii campervan rental spot early. Offices and comforts have open air picnic tables, bathrooms, showers, sinks, and drinkable water. The ocean breeze and mountain views are a little slice of heaven, where can bask in your Maui RV rental! Hawaii is a surfer's dreamland, and the Billabongs's Pipeline Masters Competition held annually at the Banzai Pipeline in the island of Oahu is one of the most exciting surfing competitions on the planet. Surfers throughout the world come to Oahu each December to test their surfing abilities and tame the monstrous waves of the sea. You will be astonished by the skill and bravery of these surfers when you lease a RV and ride the wave of glory for a visit! Each April on the Big Island of Hawaii there is a week-long jubilee that pays tribute to King David Kalakaua, otherwise called the Merrie Monarch. The occasion starts with a major show on Coconut Island highlighting hula rivalries, featuring troupes from around the world, hula shows, art exhibitions, a Miss Aloha Hula expo, and a Merrie Monarch Royal Parade. Learn about the Hawaiian way of life and its history at the Merrie Monarch Festival. Hawaii is one place not to miss. Its mixture of various Polynesian cultures, natural beauty and history are unrivaled. Whether you want to hop on the road to Hana or cruise to the Northshore, booking a RV rental in Hawaii is a great way to explore. Dive into the fun with a RV rental in Hawaii to fully appreciate what each island has to offer! Much obliged to you for picking RVnGO for your RV rental in Hawaii!